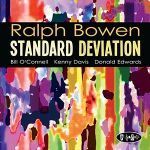 Ralph Bowen “Standard Deviation” gets a review on Dusted in Exile…. With a title that risks accusations of the overly arch, tenorist Ralph Bowen’s Standard Deviation still telegraphs its intent with admirable economy. Eight standards parsed and pieced back together in deviously different forms by a quartet of equals. Bowen quotes Zappa in the gatefold sleeve, and that influence is tangentially audible in the sanguine irreverence he brings to the arrangements of the antiquated tunes. Pianist Bill O’Connell handles two, but Bowen’s modest ingenuity informs the others. Bassist Kenny Davis and drummer Donald Edwards complete the ensemble. Blue-hair composers Richard Rodgers, Jerome Kern and Cole Porter all make appearances starting with the opening rendering of “Isn’t It Romantic”, which wastes no time in celebrating Bowen’s crushed velvet tone and agile phrasing. O’Connell keeps the rhythm section moving, goading the leader into some coarser blowing before taking a jaunty two-handed solo and priming the others for the calm that returns on the close. The origins of “No Moon At All” are a bit more obscure, but it was a number popular with Sinatra. Bowen once again engages the theme with gusto, lacing his lines with upper register cries and sprinting to double-time mid-piece amidst boisterous cymbal splashes from Edwards. “Yesterdays” and “You Don’t Know What Love Is” are the ballad equivalent of rib eye and green beans, the most standard of standards fare. O’Connell’s arrangement of the first adds some spice with some sharp comping under the Bowen’s melody statement and the brisk tempo helps, but the fossilized tune seems largely incidental when stacked against the energetic solos that frame it. Bowen takes a different approach on the second, slowing to a languorous lope and stretching his lines for heightened emotional heft. O’Connell opens up the accompaniment to enhance the sense of space. Under O’Connell’s preparations “You Stepped Out of a Dream” gains an effervescent Latin rhythm and pivots on a tune-stealing solo from the pianist while “Spring Is Here” is also the territory of the rhythm section until Bowen’s soulful return in a barrage of register-leaping runs that littered with reed effects. “Dream Dancing” and “By Myself” carry over the momentum and are almost of a piece with shifting tempo signals and a steadying central thrust by Bowen on the first matching a communal propulsion on the last. Some of the saxophonist’s signature ornamentations begin to sound the same across the disc’s duration, but there’s no doubting the level of craft, drive and dedication behind the project.